Relics Notes Beads & Aegis is what you will be going 99.99% of the time. A Broken Weave appears at the last location that each enemy god dies. The Broken Weaves give her abilities secondary effects when used on the Broken Weaves. These weaves last for 1 minute. This is a really strong passive if you know how to work with it. Basically, whenever Neith uses her Back Flip or an enemy God dies, a broken weave will appear and stay for one minute. If you were to hit the broken weave with her Spirit Arrow it would deal an extra 100% damage and root all enemies hit. So, if you hit an enemy with her Spirit Arrow and the broken weave detonated, it would deal a lot of damage. Neith fires a shot that passes through everything. Each enemy hit takes damage and is rooted. If the Spirit Arrow hits a Broken Weave, the Weave detonates, dealing an additional 100% of the damage and applying the root to all enemies in the area. This is Neith's main source of damage and clear. It is a simple line ability that passes through minions and Gods, rooting them for (1.2/1.4/1.6/1.8/2) seconds. As stated before, it works especially well when used on broken weaves. Neith neatly unravels the world weaves, damaging all enemies in the target area, reducing their attack speed, and healing Neith for each enemy hit, up to 3. Any Broken Weaves in the area are removed, healing Neith an additional amount. This gives Neith damage, helps her box other ADC's, and gives her sustain with the heal. She can heal off of enemies and/or broken weaves, and it scales off of her physical power. It will also place a 30% attack speed debuff on enemies for (2/3/4/5/6) seconds. Neith back flips through the air, creating a Broken Weave as she leaps while damaging and slowing enemies in the area in front of her. This is her main escape, but it can be used for many things. If you are confident and/or safe, you can use this to place a weave. You can also use it to slow an enemy if you have allies chasing them & your Spirit Arrow is down as it gives a 25% slow. If you'd like to style on them, you can use it to kill a low health enemy as well ! Neith charges up and fires an arrow across the world, seeking its target through obstacles. Enemy gods take damage and are stunned. The arrow can be fired quicker for diminished results. Really self-explanatory! She can shoot an arrow from anywhere on the map, stunning the enemy for 1.5 seconds and damaging them. Can you use this to steal kills? Yes. Should you? No. This ability is really good for clean up kills on enemies who are out of reach as well as stunning enemies that are chasing or running away from allies. You should really wait for it to wind entirely up because the only thing worse than getting your ultimate blocked is being impatient and them escaping with 2 hp. Gives you good ability damage - her Spirit Arrow will stun them, you basic attack, hit them with her Unravel continue to basic attack while they are debuffed. If things get scary, Back Flip. If you can time it properly (like you are being chased and you're a bit ahead) you can Back Flip and then hit the broken weave with her Spirit Arrow once the enemy gets close. Then basic attack. You can use this combo just in lane casually for extra healing - Back Flip on the enemy and then immediately put her Unravel on top of them. Basically, you Back Flip when they are chasing you or just not paying attention to the weaves. Then you Spirit Arrow the weave, place your Unravel on top of them, and basic attack. Neith starts off like any other hunter - you go to duo lane with your support and farm. It is a good idea to do your purple buff with your support after the first wave to get the extra experience. If you find that you are out clearing the enemy pretty hard and you are constantly against their tower line, you need to do something with the pressure. There is no point in having pressure if you are just sitting there allowing them to clear wave. Look to steal anything that is up - purple buff, red buff, harpies, etc. Keep in mind that the purple buff does stack with 2 people so if your support has it and you steal the enemies, you should take it and vice versa. Alternatively, if you find that the enemies are clearing wave a lot faster than you, it is a good idea to ask your jungler to clear purple buff while you stay at the wave. This prevents them from getting the extra farm and you can just clear wave until its not as big of an issue. Around early mid-game, when you clear the wave pretty well yourself, your support will leave duo lane and start wandering around. This gives you time to just farm and get huge before it is constant team fights. Around mid game, once your support starts wandering, you may find that you have gotten all the farm you can get in that moment and the enemies are hiding behind their tower. At that point, you can look to gank middle lane - only if the enemy is in the lane. If the enemy mid laner is also hiding under the tower, there's really not much to be done. Keep in mind that by ganking middle lane you will be sacrificing a minimum of one wave - realistically, you will probably sacrifice 2-3. If you gank middle lane and get no kills or assists, or even worse just go out there and die, you have done nothing but lose gold & XP. Choose your fights wisely! So let's say you've decided to gank. The enemy is near your midlaners tower line and kind of just bullying them. You should go through the entrance that is beside their red buff so you can be behind them while the mid laner is in front - they may have wards but that's okay if you are speedy. What you should do exactly depends on who the mid laner is, but basically, you will go behind the enemy, root them with her Spirit Arrow, basic attack while the mid laner does whatever, and they should be dead. You can use her World Weaver either before, during, or after the gank if you choose. - Before for the stun (though you could also just stay in your lane and use World Weaver after letting the mid laner know. - After for clean up kills if you can't chase. Now let's say that you are in your own lane, around the middle-ish and you both have your tier 1 towers. Your jungler calls for a gank. You should, first of all, make sure the enemy wave is cleared, and then back off. Do not run at the enemy until the jungler comes out to gank because that will make them back up into their tower. However, do not go so far away that you will not be able to participate in the gank because at that point there is the ADC and support and you will just get your jungler killed. You should back off slightly, kinda like you're scared, and once the jungler comes in root them with her Spirit Arrow. You cannot be missing these so make sure you are practicing. After you root them, use her Unravel and then move to the side a bit so you can avoid the CC that will inevitably come from the support and just basic attack from a distance. If you'd like you can use her World Weaver to stun an enemy that is running away. The first and most obvious tip: When you are being chased by an enemy, Back Flip and detonate the Broken Weave immediately with Spirit Arrow. - It will stun all enemies within the radius and give you extra time to escape or fight. If you're being out cleared early game and you're forced under the tower, you can do this onto the wave to clear it much faster. When up against someone who relies heavily on basic attacking speedy quick - Izanami, Artemis, Kali, etc. - consider getting Ichaival. Using Unravel with Ichaival passive reduces the enemies attack speed by 60%. If you ward properly, you can hide around a corner with your World Weaver completely charged and immediately ult them when they come around. Then you Spirit Arrow > Unravel > basic attack > they are dead. Enemies are notified when Neith's World Weaver is aimed at them via a big Neith arrow. If you were to aim your World Weaver and wait for it to charge up, it would give them plenty of time to Aegis or hide behind someone else. Instead, aim it at nothing while it charges and immediately fire it when it is on the target. If they are far away they still may block it but its a lot less likely. When being chased by enemies, you can place Neith's Unravel directly under you to heal yourself and debuff the enemy, hopefully giving yourself enough time to get your abilities up or get to your team. You should prioritize Neith's Spirit Arrow for better damage/clear and longer root duration. I would level this first. Her Unravel for damage, attack speed debuff, and better healing/sustain. I would level this second. Her World Weaver for increased global damage. I recommend to just level it as it becomes available. This is a big WIP. He can combo them and you can root them & then basic attack. He can ult onto a broken weave and you can root everyone - really good in team fights. Athena's combo obviously makes it easy for you to root enemies, but she can taunt enemies into broken weaves which is great. Especially since she's gonna have it up every 15ish seconds. ALLY: He works fine with Neith - his stuns/slows make it easier to hit her Spirit Arrow and basic attacks. He can also Stygian Torment enemies into her Broken Weave though it is a bit awkward to land. One complaint though - the player will likely accidentally body block you a million times because Cerberus takes up half the lane smh. ENEMY: His passive Spirit of Death counters Neith's Unravel and lifesteal pretty hard. It's also important to make sure you have beads to counter his Stygian Torment. Once again, he has a giant dog body so landing her Spirit Arrow and basic attacks shouldn't be an issue. It does make it easier for him to block her World Weaver though. ALLY: Sobek works pretty well with Neith, he can Charge Prey the enemy into her Broken Weave. He also peels pretty well if you are in trouble. ENEMY: He counters Neith decently with his Sickening Strike - she can't heal properly for 4 seconds. He can also Charge Prey her into the enemy team which causes her to explode. Consider beads and/or do your best to avoid that! ALLY: Ymir has lots of yummy CC, which is great for Neith. When he combos them with his Frost Breath and Glacial Strike, Neith has plenty of time to basic attack before using her Spirit Arrow. Then basic attack some more, Unravel, Ymir can Ice Wall them so they can't get away, you can World Weaver if they do get away, etc., etc. ENEMY: He does the exact same thing except against you - just don't get close to him and he can't Frost Breath you. You should definitely get beads though, and be careful if he's going bruiser because his passive makes his combo hurt. ALLY: Arachne and Neith's kits work pretty well together - you will always win a 1v2 and usually win a 2v2. Arachne Web > Cocoon > Venomous Bite them, you Spirit Arrow so they can't avoid the damage, they die. ENEMY: She is very, very scary especially early game. Make sure you are warding properly and do not try to 1v1 her - you will lose. Spirit Arrow and Back Flip away to the safety of your support. ALLY: On top of Bastet apparently being "the worst jungler right now" she doesn't really have anything Neith can work with. She can Cat Call the enemy and Neith can Spirit Arrow or World Weaver them so they can't avoid the damage. ENEMY: Worst jungler or not, she's still an assassin and she's still a squishies greatest fear. Good news is, once her burst is down you can all in her though she may peel with her Cat Call late game, or just kinda kill you with it early game. ALLY: Da Ji can Trickster Spirit > Horrible Burns them, you Spirit Arrow, she One Thousand Cuts while you basic attack, and they die. If they manage to escape Da Ji can use her Paolao or you can use your World Weaver, so it works out. ENEMY: Da Ji is really scary right now. Her Trickster Spirit > Horrible Burns does a lot of burst damage. You can try to Back Flip > Spirit Arrow her since Trickter Spirit takes a while to go off. She can Paolao you, and you have no CC immunity in your kit, so make sure you get upgraded beads asap. ALLY: Neith works really well with Kali right now. Kali can jump on them and stun them, you root them, you are both basic attacking at the speed of sound, it's not fun for the enemies at all. Additionally, you can ult an enemy that Kali is chasing and almost always guarantee an assist. ENEMY: Like I said, Kali is not fun to go against at all. She jumps on you, stuns you, you kind of just die. You can try to 300IQ predict her jump and Back Flip > Spirit Arrow her but otherwise just invest in Beads/Aegis. If you'd like! You can get Ichaival as well to increase your boxing potential. I would replace Qin's Sais with it and get Titan's Bane, or just replace Titan's Bane. Up to you. ALLY: They can work well together. Serqet Cobra's Kiss into Deathbane, you Spirit Arrow, she autos, they die. Additionally, she can Last Breath them into your Broken Weave and they kind of explode. ENEMY: She is scary if your Back Flip is down. Just try to avoid her Cobra's Kiss and she can't get the combo off on you, but she may try to Last Breath you if that happens. You can Spirit Arrow her while she is chasing to give you some time, and if her combo is down you can look to kill. I don't really recommend try to 1v1 Serqet with her full kit up because shes kind of made to kill squishes & is likely building some defense herself. But, hear me out, if she hits them with Kiss while connected to you and you stun them with Spirit Arrow with Runeforged Hammer & then basic attack.. they are dead? ENEMY: Her healing is really annoying until you get your anti-heal online, but other than that there isn't much to worry about. If she's going full damage you can just avoid her Kiss and then attack from a distance so she can't hit you with Back Off!. If she is tankier then she's not really a concern, just annoying and hard to kill. Aside from that, they both have really good cleanup potential - Fire Shards will give you enough vision to World Weaver any escaping enemy that will survive it. ENEMY: She is scary late game with her combo up but if you wait it out or manage to dodge it, she dies really easily. She will most likely use her Fire Shards if she is dying, though it's not that big of a deal if you avoided her combo initially. She can use her Mysterious Fog to set up ambushes so watch out for those - don't be an idiot like me and ignore them and then get 4 man ganked. Other than that, be aware of the obvious problem - getting killed by her Fire Shards when running away. Make sure you buy Aegis. ALLY: Artemis and Neith work really well together - she can slow, root, stun, etc. giving you plenty of time to use Neith's Spirit Arrow for a lot of damage and extra CC. With your World Weaver, Back Flip, and Spirit Arrow and her Transgressoner's Fate, Suppress The Insolent and Calydonian Boar, there is a lot of CC & kill potential. ENEMY: Neith's early game clear is a lot better than Artemis' so don't be afraid to play a bit more aggressively initially - just be careful once she hits level 5. Late game Artemis frags - just make good use of Neith's Unravel and don't step in her Transgressoner's Fate. Transcendence, Warrior Tabi, and The Crusher are Neith's core items - they will be in almost every build. For that reason, I'll only explain their purpose once. Transcendence has nice stats but everyone builds it for the passive. You gain 15 mana per stack for a max of 50 stacks (1050 mana total including the 300 base mana). Additionally, 3% of your mana is converted to physical power. It is a really good item and you should be building this every single time. Warrior Tabi because you don't want to be a snail. Ninja Tabi isn't really that great because Neith relies pretty heavily on her abilities even in basic attack builds. The Crusher provides 20% attack speed, power, and 15 flat pen. The passive works really, really nicely with Neith. Her Spirit Arrow has a 2s duration and so does The Crusher passive - how convenient! Now that we are done with her core items, time to move on to the more "situational" ones! Soul Eater is amazing if you are going ability based - it gives you great healing off of her Unravel. You are able to heal to full pretty easily and rejoin fights. The mana also helps Transcendence passive. Jotunn's Wrath is really good on Neith. I recommend getting it 90% of the time, you can only really get away with it if you are going a full basic attack build. At that point though, what's the point in choosing Neith? Go main Izanami or something. This item doesn't have a passive but the stats are really good - 20% CDR, flat pen, mana to help Transcendence passive, etc. Titan's Bane is really good against tanks, obviously, as it does percentage pen. Definitely not something you'll be getting everytime as there are viable alternatives, but it is really nice. Heartseeker is... -chefs kiss- The passive makes Neith scary - imagine hitting an enemy god with her Spirit Arrow onto a Broken Weave with Heartseeker passive proc. They would explode. Flat penetration is nice as well as mana and MP5. What is the overall purpose of this build? Lots of ability based damage, lots of penetration, some attack speed, and decent healing. This is a nice go to build for when there are 2 tanks (solo & support) and the jungler decides to go a bit bruiser-y. I have already explained all of the above items except Bloodforge so this explanation is going to be a pretty quick one. Bloodforge is nice if you want to play a bit more aggressively. The 75 power and base lifesteal are really nice to have, especially with Soul Eater, but the passive is what makes it so valuable. The shield allows you to play aggressively and have a better chance of surviving/fighting. In my example build, I've replaced Titan's Bane with this. So if you feel that the enemy team isn't building tanky, (maybe the support is tanky and the solo laner is going more bruiser) and you'd like to play more aggressively, it'd be smart to pick this up either last or after you sell boots. The overall purpose of this build is extra lifesteal & more aggressive plays. So FYI you are going to be building Titan's Bane last item and selling Warrior Tabi for Odysseus' Bow, but I didn't feel like including Titan's Bane since I've already talked about it. This build is clearly a lot more attack speed based, with 100% total attack speed via items. Basically, you better be landing your autos or sticking to the previous 2 builds. The Executioner goes well with Qin's Sais as they give you attack speed, power, and penetration from the passive. Basically they work together to make Neith's autos hit hard. Odysseus' Bow is nice to have, but not really required. It gives her a lot of attack speed and the passive gives her some extra damage. It works nicely in teamfights. So the overall purpose of this build is strong basic attacks. Her abilities won't do as much, obviously, but they will still hit pretty hard. Same as the last build except Asi for lifesteal. Asi is really good right now - 15 flat pen, life steal, attack speed, etc. and I've found that it works especially well when paired with The Executioner and Qin's Sais. The same purpose as the last build except it has lifesteal and more penetration. Asi can replace Odysseus' Bow to sacrifice the passive and some attack speed or Titan's Bane to sacrifice % penetration. This is just a standard ability based build - nothing that remarkable about it. What I want to talk about is [[Runeforged Hammer]! It works pretty well with Neith, especially in this meta. The passive procs off of her Spirit Arrow], [[Back Flip, Broken Weave combo, and World Weaver, giving you 15% increased damage. You literally get your own red buff when enemies are CC'd. Magi's Cloak is nice to have if you are either against a lot of CC or against Awilix. The passive will absorb a single CC/root and give you 1s of immunity every 70s - so if you are against Awilix and have your bubble, she can't ult you when you Back Flip. Mantle of Discord is really good defense if you are getting blown up or want to play more aggressively. 60 magical & physical protection along with 10% CDR and the passive is great to have when needed. Brawler's Beat Stick is an anti-heal alternative to The Crusher in an ability based build. Toxic Blade is an anti-heal alternative to Asi or The Executioner in an attack speed build. Stop that. Neith is ability based and building her crit means utilizing her to the worst of her abilities. If you want to go crit, learn how to play Izanami, Jing Wei, or Artemis, to name a few. these are basic attack oriented hunters that have steroids & do really well with crit. As an FYI, you mention the possibility of getting Ichaival...but it's not anywhere in your situational items at the top. It should be there. 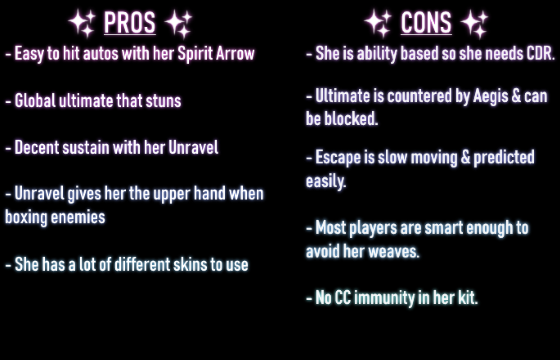 Also, your tips should include the more specific tip (unless I missed it) about using a broken weave with Spirit Arrow. Specifically, for stronger clear, especially against the higher health melee minions, you don't shoot the spirit arrow until the melee ones have passed the weave. Then you shoot through them for the initial damage, THEN it hits the weave and you get additional damage on both the melee AND the ranged. That's where you get the more efficient clear. 141933 Branmuffin17 As an FYI, you mention the possibility of getting [[Ichaival]]...but it's not anywhere in your situational items at the top. It should be there. Also, your tips should include the more specific tip (unless I missed it) about using a broken weave with [[Spirit Arrow]]. Specifically, for stronger clear, especially against the higher health melee minions, you don't shoot the spirit arrow until the melee ones have passed the weave. Then you shoot through them for the initial damage, THEN it hits the weave and you get additional damage on both the melee AND the ranged. That's where you get the more efficient clear. Also, at this point, I think Odysseus' Bow is outshone depending on build. In the example you have, it works and is pretty meta, but I think Ichaival might be the better option there. Much higher power potential (works great with her ability scaling), counters enemy ADCs/assassins, and just a bit less AS. Also, when you build into Qin's Sais, the power difference between Warrior and Ninja isn't all that huge that you can't consider Ninja's for better basic attack DPS. Of course, you'll replace Tabi late anyway, but that's something to consider. 141935 Branmuffin17 Also, at this point, I think [[Odysseus' Bow]] is outshone depending on build. In the example you have, it works and is pretty meta, but I think [[Ichaival]] might be the better option there. Much higher power potential (works great with her ability scaling), counters enemy ADCs/assassins, and just a bit less AS. Also, when you build into [[Qin's Sais]], the power difference between Warrior and Ninja isn't all that huge that you can't consider Ninja's for better basic attack DPS. Of course, you'll replace Tabi late anyway, but that's something to consider. In the runeforged build I would get trans before runeforged because you need to stack it. 138753 Kriega1 In the runeforged build I would get trans before runeforged because you need to stack it. Qin's Sais pairs really well with The Executioner (attack speed and protection reduction) and O-bow (attack speed). I wouldn't build Qin's without exe, personally. 138452 Gulfwulf [[Qin's sais]] pairs really well with [[the executioner]] (attack speed and protection reduction) and O-bow (attack speed). I wouldn't build Qin's without exe, personally. Trans, warrior, crusher, titans, qins, o-bow. 138754 Kriega1 You can build qins without executioner on neith if you pick up o-bow: Trans, warrior, crusher, titans, qins, o-bow. yeah i thought so too, but I wasnt really sure what to replace it with so I left it alone. maybe heartseeker?? 138462 Perfectium yeah i thought so too, but I wasnt really sure what to replace it with so I left it alone. maybe heartseeker?? trans, warrior, crusher, titans, qins, odysseus' bow. You don't need executioner. But you can build it I guess. 138463 Kriega1 trans, warrior, crusher, titans, qins, odysseus' bow. You don't need executioner. But you can build it I guess. I mean you can get away with titans and qins without exe on Neith but then you have to build O-bow because your attack speed will be so low. 138453 Kriega1 I mean you can get away with titans and qins without exe on Neith but then you have to build O-bow because your attack speed will be so low. No problem. But, it still impossible. The levels that the ulti is available to upgrade are: 5,9,13,17,20. 138445 xmysterionz No problem. But, it still impossible. The levels that the ulti is available to upgrade are: 5,9,13,17,20. You should also be prioritising points in your ult before fully maxing the 3. 137915 Kriega1 You should also be prioritising points in your ult before fully maxing the 3. No heartseeker? Malice in season 6??? 137855 Kriega1 No heartseeker? Malice in season 6??? In build 2 swap malice for heartseeker. Deathbringer can be swapped for bloodforge. Trans, Warrior, Jotunns, beatstick (or crusher), heartseeker, titans bane (or bloodforge). Also for your "attack speed" build I would sell jotunns lategame for odysseus' bow to get more benefit from qins. Or instead what you could do is go: trans, warrior, crusher, titan's bane, qins, odysseus's bow, sell boots lategame for either executioner, jotunns or bloodforge. 137913 Kriega1 In build 2 swap malice for heartseeker. Deathbringer can be swapped for bloodforge. Though an alternative build with it: Trans, Warrior, Jotunns, beatstick (or crusher), heartseeker, titans bane (or bloodforge). Also for your "attack speed" build I would sell jotunns lategame for odysseus' bow to get more benefit from qins. Or instead what you could do is go: trans, warrior, crusher, titan's bane, qins, odysseus's bow, sell boots lategame for either executioner, jotunns or bloodforge. Hey, just a quick question. What start would you recommend for Neith? I've tried Charged Morningstar + pots, however I was wondering if you recommend anything else. 137852 UPLAR Hey, just a quick question. What start would you recommend for [[neith]]? I've tried [[charged Morningstar]] + pots, however I was wondering if you recommend anything else. Hunters Blessing & tier 1 trans + pots, or the same thing except starting boots first is what I usually do. 137896 Perfectium Hunters Blessing & tier 1 trans + pots, or the same thing except starting boots first is what I usually do. Hunter's blessing if you're adc otherwise you always go mage's blessing in mid lane for the faster clear. 137914 Kriega1 Hunter's blessing if you're adc otherwise you always go mage's blessing in mid lane for the faster clear. Either that start or mage's blessing and tier 1 transcendence + pots. 137854 Kriega1 Either that start or mage's blessing and tier 1 transcendence + pots. I would get Bloodforge instead of Asi. I'd also get Titan's Bane instead of Qin's Sais. And lategame you could sell The Crusher for Odysseus' Bow. Brawler's Beatstick can also be a decent alternative to Jotunn's Wrath. Since this is a an ADC build and not a mid build I guess it's fine to build a little bit of attack speed, but i'd rather just build her ability based: Warrior Tabi (can sell for ninja tabi lategame), Transcendence, Crusher, Jotunns/brawlers, Titan's Bane, bloodforge, sell crusher for oddyseus' bow. The only defense items I would consider (in certain situations) are: Mantle of Discord, Magi's Cloak, Winged Blade or a physical/magical defense item against a 4 physical/magical enemy composition in conquest. 127208 Kriega1 I would get [[Bloodforge]] instead of [[Asi]]. I'd also get [[Titan's Bane]] instead of [[Qin's Sais]]. And lategame you could sell [[The Crusher]] for [[Odysseus' Bow]]. [[Brawler's Beatstick]] can also be a decent alternative to [[Jotunn's Wrath]]. Since this is a an ADC build and not a mid build I guess it's fine to build a little bit of attack speed, but i'd rather just build her ability based: Warrior Tabi (can sell for ninja tabi lategame), Transcendence, Crusher, Jotunns/brawlers, Titan's Bane, bloodforge, sell crusher for oddyseus' bow. The only defense items I would consider (in certain situations) are: [[Mantle of Discord]], [[Magi's cloak]], [[Winged Blade]] or a physical/magical defense item against a 4 physical/magical enemy composition in conquest. I disagree with you favoring titans bane over qins and o.bow over crusher. Bloodforge is debatable. See what bran wrote down below. 127213 boogiebass I disagree with you favoring titans bane over qins and o.bow over crusher. Bloodforge is debatable. See what bran wrote down below. Neith is an ability based adc (attack damage carry). Your build provides low penetration and power, due to you building double defense. I dont agree with your full build, but the dmaage options you posted are good. Your skill order is all over the place. 127111 boogiebass Neith is an ability based adc (attack damage carry). Your build provides low penetration and power, due to you building double defense. I dont agree with your full build, but the dmaage options you posted are good. Your skill order is all over the place. Hi Perfect, after you are finished with your edits, please press "Save" and "Publish" for the guide to be visible to others. Also, as Tlaloc pointed out, a hunter should only build defense in extreme cases. In my opinion, you can list defense under optional items, but I wouldn't include it in the example build. 1) Power. I'm not talking about Transcendence (It's a good item on Neith, but it's not the core damage item I'm talking about). Either build critical hit items, or Qin's Sais somewhere in your build (I think Qin's Sais benefits her more since she's ability based). These are the high damage items a hunter will use to dispose of their enemies. 2) Penetration - include Titan's Bane as an option since Neith is aiblity based. 3) Lifesteal - you don't have this anywhere in your build. Asi might be a good choice for neith due to the +15 flat penetration. At the end of the day, it is your guide, so do whatever you want with our advice. 127177 boogiebass Hi Perfect, after you are finished with your edits, please press "Save" and "Publish" for the guide to be visible to others. Also, as Tlaloc pointed out, a hunter should only build defense in extreme cases. In my opinion, you can list defense under optional items, but I wouldn't include it in the example build. Remember, an ADC needs 3 things: 1) Power. I'm not talking about [[transcendence]] (It's a good item on Neith, but it's not the core damage item I'm talking about). Either build critical hit items, or [[qin's sais]] somewhere in your build (I think [[Qin's sais]] benefits her more since she's ability based). These are the high damage items a hunter will use to dispose of their enemies. 2) Penetration - include [[titan's bane]] as an option since Neith is aiblity based. 3) Lifesteal - you don't have this anywhere in your build. [[Asi]] might be a good choice for neith due to the +15 flat penetration. At the end of the day, it is your guide, so do whatever you want with our advice. Also you'd overcapped CDR w/ BoV + Jotunn's + Trans. If in Conquest, The Crusher is a solid item immediately after Transcendence. You can consider Jotunn's Wrath to be optional in Conquest, but it's great if you're in a teamfight mode like Arena or Clash. If you're getting Qin's Sais, you'll probably want more attack speed...you can keep the rest of the build, but late game replace Warrior Tabi with Ninja Tabi...the 20% AS will help more for your DPS compared to 20 higher power from Warrior. Oh, and since you mention Conquest, your starting items don't work (they add up to 2,100 gold, which is 600 above starting). You're probably best going with Mage's Blessing + T1 Trans + Potions, or just starting with Charged Morningstar. 127178 Branmuffin17 Also you'd overcapped CDR w/ BoV + Jotunn's + Trans. If in Conquest, [[The Crusher]] is a solid item immediately after [[Transcendence]]. You can consider [[Jotunn's Wrath]] to be optional in Conquest, but it's great if you're in a teamfight mode like Arena or Clash. If you're getting [[Qin's Sais]], you'll probably want more attack speed...you can keep the rest of the build, but late game replace [[Warrior Tabi]] with [[Ninja Tabi]]...the 20% AS will help more for your DPS compared to 20 higher power from Warrior. Oh, and since you mention Conquest, your starting items don't work (they add up to 2,100 gold, which is 600 above starting). You're probably best going with [[Mage's Blessing]] + T1 Trans + Potions, or just starting with [[Charged Morningstar]]. In my opinion, this looks much more like a standard neith build. It looks a lot better than what you had at first. I like it. Let's see what bran muffin has to say. Good job on the edits. 127196 boogiebass In my opinion, this looks much more like a standard neith build. It looks a lot better than what you had at first. I like it. Let's see what bran muffin has to say. Good job on the edits. Late game, you might still consider switching Ninja Tabi, especially when you opt for Qin's Sais. That commitment to Qin's means you'll expect to do decent damage with basics, and you want to get the most out of its passive as possible. Adding attack speed by switching Tabi is one way to do that. Asi is a common pairing with Transcendence, but with Neith's healing in Unravel you might opt to skip lifesteal. This will allow you to get a different item with some other utility. The other negative about Asi with Neith is that she has such strong scaling in her abilities...Asi has 0 power, so you lose out there. I think getting Jotunn's Wrath for her is okay as a strong commitment to being a physical mage and spamming abilities. If you do that, you might choose altogether to skip that basic attack function, and go all out with both Brawler's Beat Stick and either Titan's Bane or Hydra's Lament. If you do skip either Asi or Jotunn's Wrath, keep Qin's and add The Executioner. thanks! yea when trying the new build out i found that the lifesteal aspect of asi wasn't really worth it (it could be the way i did my build bc i know asi is usually good) - ive replaced asi with the executioner and ive added a second build with your other advice since i couldnt cover everything in one build! 127228 Perfectium thanks! yea when trying the new build out i found that the lifesteal aspect of asi wasn't really worth it (it could be the way i did my build bc i know asi is usually good) - ive replaced asi with the executioner and ive added a second build with your other advice since i couldnt cover everything in one build! Huh. That's interesting. I thougt all hunters required either qins or at least 2 crit items. I thought asi was good on her due to the +10 flat pen. The reason I also suggested asi was because of attack speed boost for qins sais. The best bet would be to keep asi and replace jotuns with the executioner. Keep in mind, he does list executioner as an option. 127212 boogiebass Huh. That's interesting. I thougt all hunters required either qins or at least 2 crit items. I thought asi was good on her due to the +10 flat pen. The reason I also suggested asi was because of attack speed boost for qins sais. The best bet would be to keep asi and replace jotuns with the executioner. Keep in mind, he does list executioner as an option. If you're building traditional hunters with a focus on basic attacks, then yes, either Qin's Sais or 2 crit items are usually core. The "problem" here is that Perfectium has committed strongly to abilities by adding Jotunn's Wrath to the example build. If you're going to do that, then I feel just going full ability is likely better. In my last point above, I did say skip either Asi or Jotunn's, and add Exe...so yes, that fits with what you concluded. Exe + Asi + Ninja + Qin's is plenty of attack speed to get good use out of Qin's passive. Asi isn't specifically good just due to flat pen. It's been nerfed that way, and given an attack speed boost to compensate. So it's skewed in the direction of basic attack focus. 127214 Branmuffin17 If you're building traditional hunters with a focus on basic attacks, then yes, either [[Qin's Sais]] or 2 crit items are usually core. The "problem" here is that Perfectium has committed strongly to abilities by adding [[Jotunn's Wrath]] to the example build. If you're going to do that, then I feel just going full ability is likely better. In my last point above, I did say skip either Asi or Jotunn's, and add Exe...so yes, that fits with what you concluded. Exe + Asi + Ninja + Qin's is plenty of attack speed to get good use out of Qin's passive. Asi isn't specifically good just due to flat pen. It's been nerfed that way, and given an attack speed boost to compensate. So it's skewed in the direction of basic attack focus. Yea that's what I was trying to say. Asis attack speed helps with the qins passive. The 10 flat pen is definitely nice though. 127215 boogiebass Yea that's what I was trying to say. Asis attack speed helps with the qins passive. The 10 flat pen is definitely nice though.